A paleontological team that includes scientists from the American Museum of Natural History; University of California, Santa Barbara; and Case Western Reserve University has described two ancient species of South American rodents, including the oldest chinchilla, a discovery that substantiates what might be the earliest grasslands in the world. 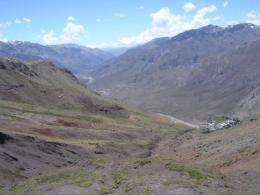 The two new species lived near a chain of volcanoes about 32.5 million years ago in what are now the steep slopes of a river valley in the Chilean Andes. Studies of the teeth of the ancient chinchilla support evidence from other species in the concurrent fauna indicating that the animals inhabited an open and dry environment 15 million years before grasslands emerged elsewhere in the world. 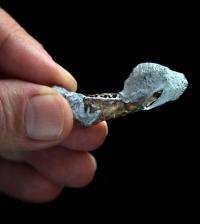 The research is published this week in American Museum Novitates, a peer-reviewed scientific journal of the American Museum of Natural History. "The new chinchilla fossil provides important new evidence that early rodents joined other South American mammals in evolving ways to cope with an abrasive diet long before horses, sheep and other mammal groups on other continents 'invented' similar adaptations for making their teeth wear out more slowly while eating tough grasses," said John Flynn, Frick Curator of Fossil Mammals and dean of the Richard Gilder Graduate School at the American Museum of Natural History, who is a co-author of the paper. Flynn and colleagues have explored the fossil history preserved in the Chilean Andes for the past 25 years. In the Tinguiririca River valley, an area near the border of Chile and Argentina once thought to be inhospitable to fossils because of the dominance of volcanic rocks, the researchers have uncovered hundreds of specimens, including the two newly named species of early South American rodents. The new specimensAndemys termasi, for which the genus name means "mouse of the Andes" and the species name refers to the nearby town of Termas del Flaco, and Eoviscaccia frassinettii, named for the late Daniel Frassinetti, who was a longtime collaborator and head of paleontology at Chile's National Museum of Natural Historyare the second-oldest rodents ever discovered in South America. The oldest are recently discovered 41-million-year-old rodents from Peru. The new species are distinguished from the older rodents by many features of their teeth. Rodents are known and named for their ever-growing incisors, which they use for gnawing. Yet the back or "cheek" teeth, used for grinding, have a special story to tell in this case: one that focuses on the crown, the portion of the teeth protected by long-wearing enamel. While the Peruvian rodents had cheek teeth with a crown extending only to the gum line, one of the new ancient Chilean rodents has high crowns that extended underneath the gums, enabling it to eat gritty foods like grass. "The Tinguiririca chinchilla replicates a dental pattern appearing in many other South American herbivores such as Notoungulateshooved animals that are now extinctat that time. This pattern is called hypsodonty," said lead author Ornella Bertrand, who conducted the research through the Museum's Annette Kade Graduate Student Fellowship Program. Hypsodonty, the quality of having high-crowned teeth, is a trait that emerged in multiple kinds of animals, such as horses, goats, and cows. Hypsodonty is generally interpreted as an adaption that arose in response to the spread of grassy environments. The age of the fossils and the high-crowned teeth of the new chinchilla and many other mammals in the same fauna suggest to researchers that the mountainous Tinguiririca River valley was a grassy plain at the time the debris from a volcanic eruption buried them. This means that the Chilean Andes supported plains environments some 15 million years before such ecosystems are known on other continents. 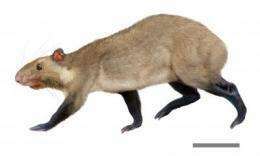 "In addition to being preserved in unusual volcanically derived sediments, the new rodent species are notable for coming from what is assuredly one of the most spectacularly scenic and rugged sequences of fossil mammal localities in the world," said co-author André Wyss, of the University of California, Santa Barbara. The new rodent species indicate that there was explosive diversification on South America when it was an island continent, before the formation of the Isthmus of Panama about 3.5 million years ago. Eoviscaccia frassinettii, which is related to the modern chinchilla, and, Andemys termasi, related to a lesser-known group that includes the agoutis, a group of short-tailed rat-like species also native to South and Central America, belong to what originally was an exclusively South American group of rodents called caviomorphs. Caviomorph rodents include the New World porcupines, capybara, guinea pig, and many others. Based on the fossil record and evolutionary relationships, the ancestors of these animals are thought to have come to South America from Africa on rafts of debris. Once on the massive island, caviomorphs diversified into some of the unique species we see today. "The island continent of South America represented a land of evolutionary opportunity for the ancestors of chinchillas and other caviomorph rodents," said co-author Darin Croft of Case Western Reserve University in Cleveland. "These remarkable rodents came to fill an amazing variety of ecological niches and today are among the most characteristic Neotropical mammals." More information: O. C. Bertrand, J. J. Flynn, D. A. Croft, A. R. Wyss, Two New Taxa (Caviomorpha, Rodentia) from the Early Oligocene Tinguiririca Fauna (Chile), American Museum Novitates, 3750: 136, (2012).